Ukraine can reduce its energy dependence and build a strong economy on clean and safe renewable energy, a new study shows. Unfortunately, the latest Energy Strategy adopted by the government in August shows a complete lack of ambition to pursue a low-carbon transition. Ukraine’s “nationally determined contribution” under the Paris Agreement is the least ambitious in the world, according to an independent analysis. A new study, “Transition of Ukraine to the Renewable Energy by 2050“, conducted by experts from the Institute for Economics and Forecasting of the National Academy of Sciences of Ukraine with the support of the Heinrich Böll Foundation, shows that Ukraine has every chance to make a successful energy transition. The team of researchers led by Oleksandr Diachuk has modelled three potential scenarios of the future of Ukrainian energy sector: Conservative, Liberal and Revolutionary. According to the Revolutionary Scenario (Fig. 1), which assumes consistent government measures to support renewable energy sources (RES) and energy efficiency, the share of RES in the total final consumption of energy resources (FCER) may increase to 91% by 2050. Fig. 1. Increase in the share of RES in the structure of the total final consumption of energy resources and impact of energy efficiency according to the Revolutionary Scenario. Axis on the left — mln toe. The remaining 9% of energy consumption mainly relates to the metallurgical and chemical industries, which use fossil fuels not only as energy sources, but also as feedstock. By 2050, the existing energy-intensive enterprises inherited from the Soviet Union will most likely be closed down or reconstructed using new technologies according to new market needs. In the transportation and services sector and for heating purposes, other options are available: the use of energy-efficient technologies in construction, widespread use of electric cars, electrification of passenger and freight transport, the use of heat pumps for heating and cooling, and more efficient household appliances and electronics. All this will require a significant amount of electricity, and it is therefore expected that the share of electricity in the FCER will significantly increase. 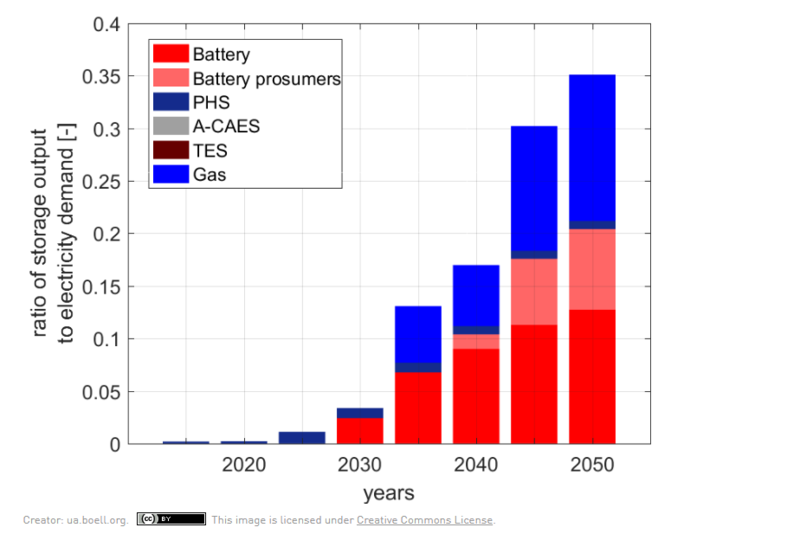 The Revolutionary Scenario suggests that the share of electricity will increase from 17% in 2012 to 56% in 2050. Thanks to energy efficiency measures and energy saving this extensive electrification of the economy will result in only a moderate rise in electricity demand, which will be 14% higher than under the Conservative Scenario. By 2050 under the Revolutionary Scenario annual electricity consumption can reach 366 bln kWh. To provide this amount of electricity from renewables Ukraine will need to build 52 GW of wind, 127 GW of solar capacities and 7 GW of biogas and biomass cogeneration plants. Also major investments in grid modernization and energy storage will be required. Building a bigger and cleaner power system will result in additional investment of €99 bln by 2050, compared to the Conservative Scenario, which does not assume structural changes in the power sector and new technological advancements. 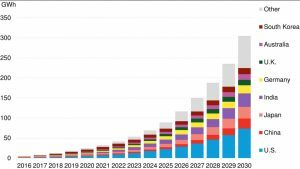 The biggest amount of the needed investments is projected for 2040-2050. 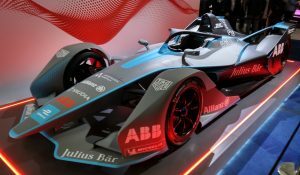 It is likely that new technologies will become available on the market in the next 10-15 years, which will allow a significant reduction of the cost of energy transition and allow for a more equal distribution of the investments over time. 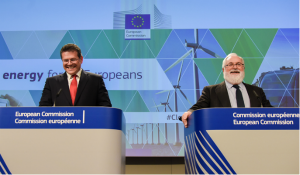 On the other hand, the Revolutionary Scenario shows that annual costs of fuel and maintenance can be significantly reduced from 2020 on and that by 2050 annual savings can reach €16 bln for the whole energy sector. 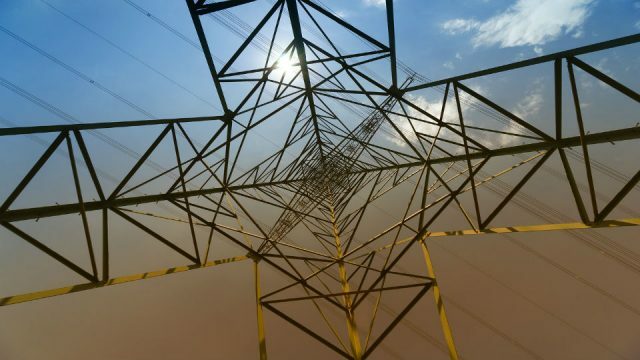 The report also shows that existing RES technologies and resources in Ukraine are sufficient to meet the growing demand for electricity while simultaneously replacing the outdated, worn-out and environmentally hazardous facilities of the traditional power industry. Fig. 2. Increase in the share of RES in the production of electricity according to the Revolutionary Scenario. Axis on the left — bln kWh. These findings are confirmed by another study, “The role of storage technologies for the transition to a 100% renewable energy system in Ukraine“, written by researchers from Lappeenranta University of Technology (Finland), which shows that it is technically possible and economically feasible to completely transform the Ukrainian energy sector achieving 100% RES in the electricity supply. 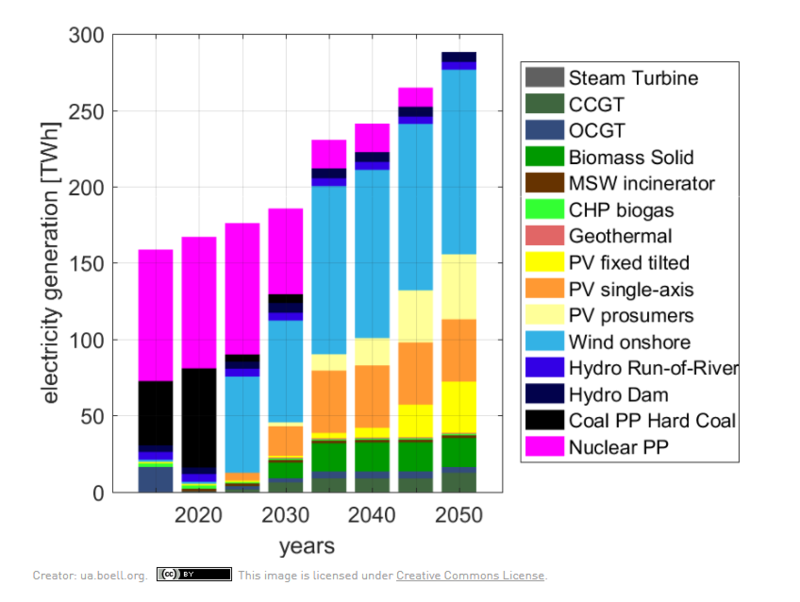 At the same time, all existing coal power capacities can be gradually replaced and decommissioned by 2035. The scenario for the electricity industry offered by these international researchers also involves the gradual closure of nuclear power plants. The last reactor should be taken out of service and enter decommissioning in the second half of the 2040s. By that time, Energoatom should have accumulated sufficient funds to finance the decommissioning of nuclear power plants and the safe management of radioactive waste. Fig. 3. Results of modelling the operation of the United Energy System (UES) of Ukraine in 2050 with a 100% share of RES. Hourly modelling of the operation of the United Energy System (UES) (Fig. 3) shows that it is possible to achieve a stable power supply in Ukraine throughout the year and in all weather conditions based on a combination of existing RES technologies, gas turbines (at an intermediate stage), and, later, in particular after 2030, energy storage and conversion technologies. By 2035 (Fig. 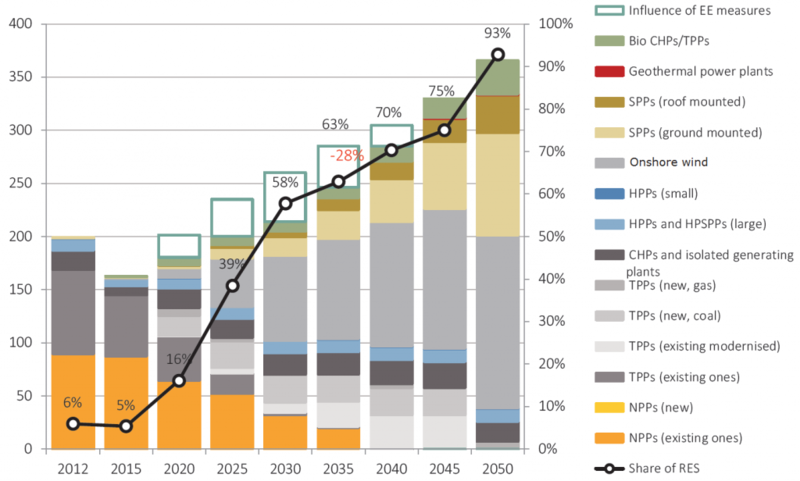 4, upper diagram) 90% of electricity production could be provided by renewable energy sources. 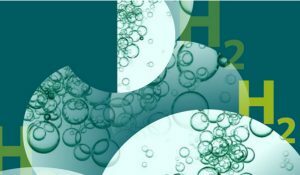 This modelling includes existing and perspective battery storage solutions, as well as Pumped Hydro Storage (PHS), Adiabatic Compressed Air Energy Storage (A-CAES) and Thermal Energy Storage (TES). The authors emphasize that, considering the long-term trends in technological development and cost reduction in renewable energy and energy storage, such a restructuring combined with major improvements in energy efficiency is economically sound. How ambitious are current national goals? In short, technological solutions are available for Ukraine to transition to an economy based on clean renewable energy sources. However, there are still significant obstacles in the form of regulatory and political aspects. The goal of switching to renewable energy sources by the middle of the century seems ambitious in Ukraine more from a political point of view than from a technical and economic perspective. Indeed, the Energy Strategy of Ukraine until 2035, approved by the government in August 2017, sets very inadequate targets in energy efficiency and renewables. Currently, the Ukrainian economy is the most energy-wasteful in Europe. Production of one unit of GDP in Ukraine consumes 3-4 times more energy than the EU average. 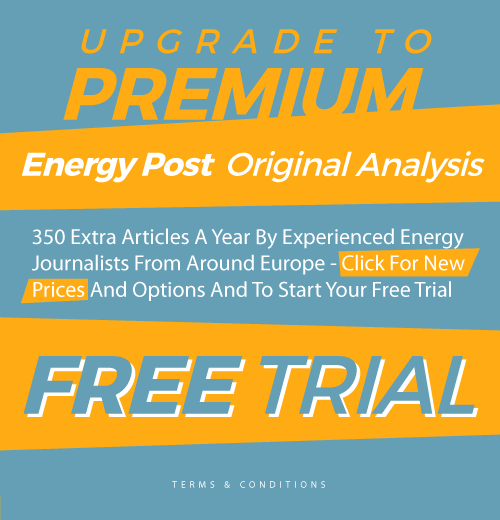 The new Energy Strategy does not set a specific energy saving goal, which is justified by the uncertainty of forecasting final energy consumption in Ukraine under the conditions of external aggression and loss of part of its territory. Instead, it sets a target indicator for primary energy intensity of GDP, but this is no improvement on the actual energy intensity today. Due to the occupation of the Donbas, the annexation of the Crimea and economic decline, final energy consumption in Ukraine fell from 67 million toe (tonnes of oil equivalent) in 2012 to 47.5 million toe in 2015. According to the forecasts used as a basis for the Energy Strategy, which presume the restoration of the territorial integrity of Ukraine, total demand for energy resources in 2035 will grow by 6.5% relative to the level of 2010-2012. Since there are no significant changes in the projected energy supply structure, Ukraine will remain dependent on fossil fuels (coal, oil and gas), a significant part of which will have to be imported. Note that the current National Energy Efficiency Action Plan for the Period until 2020 states that required financing for energy efficiency and energy saving measures for 2015-2020 is €35 billion (€7 billion/year), which would allow to reduce final energy consumption by 6.5 million toe or 9% relative to the average level for 2005-2009. In reality, state support for energy efficiency in 2017 was only UAH 800 million (EUR 0.026 billion). Obviously, without a major increase of state support, it is unlikely that the energy saving goal for 2020 will be reached. The renewable energy target for 2035 in the Energy Strategy is only 25% of final energy consumption. 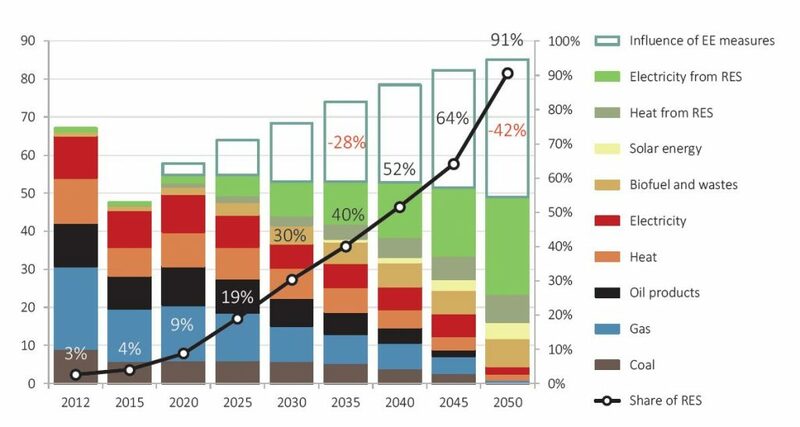 According to the Revolutionary Scenario, it is possible to achieve by 2035 a share of renewable sources of 40% with a simultaneous reduction of overall consumption by 28% through energy savings and energy efficiency measures (see Fig. 1). 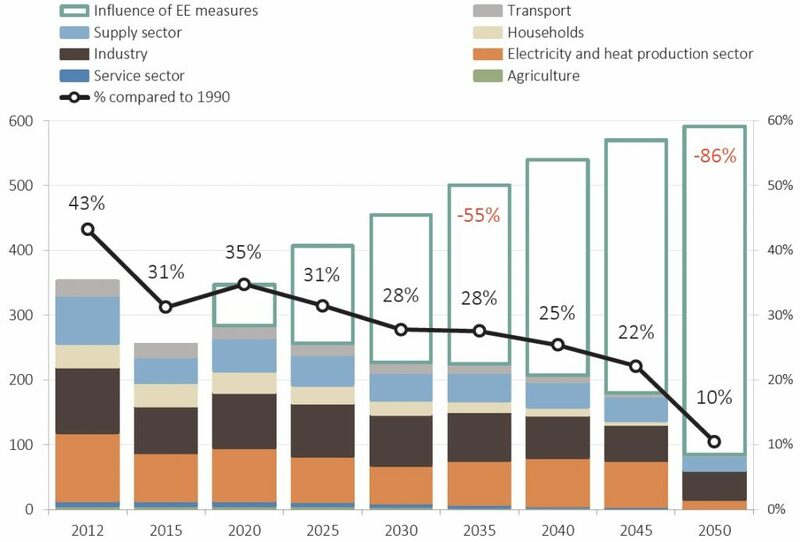 With regard to electricity production, the Strategy sets a target also of 25% in 2035, whereas 90% is technically achievable (Fig. 4) and 63% is economically feasible (Fig.2). An even bigger problem is that the Energy Strategy sets a highly inadequate greenhouse gas emission target. In its Intended Nationally Determined Contribution to the UNFCCC under the Paris Agreement, Ukraine has proposed a greenhouse gas emission level of 60% in 2030 compared to 1990. However, in 2012 the level was only 42.6%,so the target allows carbon pollution to grow significantly. Although the Energy Strategy of Ukraine till 2035 establishes as a target that CO2 emissions are not to exceed 50% of the 1990 level in 2035, that again does not foresee an emissions reduction compared to 2012 (43% of 1990 level). Calculations by The Institute for Economics and Forecasting of the National Academy of Sciences of Ukraine show that even in the absence of any progress in renewables and energy efficiency, with energy consumption increasing proportionally to GDP growth (Conservative Scenario), greenhouse gas emissions in 2030 will not exceed 56% of the 1990 level. It is no coincidence that in the annual ranking of international agency Climate Action Tracker, Ukraine received the lowest ranking of the national climate policy goals declared by the states under the Paris Agreement. Under the Revolutionary Scenario, Ukraine can achieve greenhouse gas emissions of 28% in 2030 and 10% in 2050 compared to the 1990 level. This proves the need for Ukraine to revise its INDC and submit much more ambitious and structured goals under the Paris Agreement in 2018, which will attract innovative companies and investments in a “green” modernization of the economy. Fig. 5. Expected greenhouse gas emissions in Ukraine under Revolutionary Scenario. What should be Ukraine’s energy transition policy? 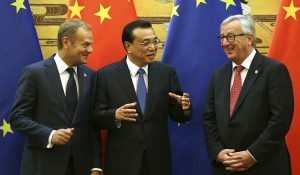 If Ukraine wants to be integrated into the European Union, help combat the global climate crisis, replace its environmentally hazardous and obsolete energy infrastructure inherited from the Soviet Union along with its dependence on energy supplies from Russia, the country should embrace clean energy solutions and promote development and rapid introduction of renewable energy sources, improvement of energy efficiency, and a reduction of the fossil fuel consumption. Individual officials do recognize the need for such a course for Ukraine, but there is still no clear position of the government as whole and individual political factions on climate and energy issues. So far, only some positive developments have taken place in this direction. In particular, during his speech in June 2017 at the Forum “Clean Energy for a Sustainable Future” in Vienna, Minister of Ecology and Natural Resources Ostap Semerak stated that Ukraine is ready to be an active participant in the international fight against climate change and is aware of the importance of the transition of the national economy on the basis of “green” development model. 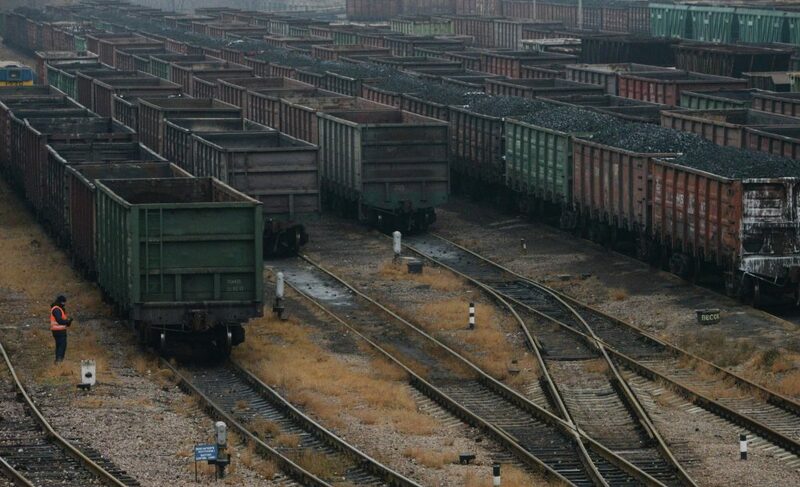 At the same time, there are no such signs from the Ministry of Energy and Coal Industry. The Ministry keeps away not only from the issues of RES development and support of energy efficiency measures, but also from the urgent tasks of restructuring coal mining and thermal power generation in a socially responsible manner. Operators of coal power plants, the average age of which exceeds 45 years, have no incentives or financial instruments for modernization and reduction of toxic emissions of ash, sulphur and nitrogen oxides, which are among the highest in Europe and cause grave damage to the health of the population. 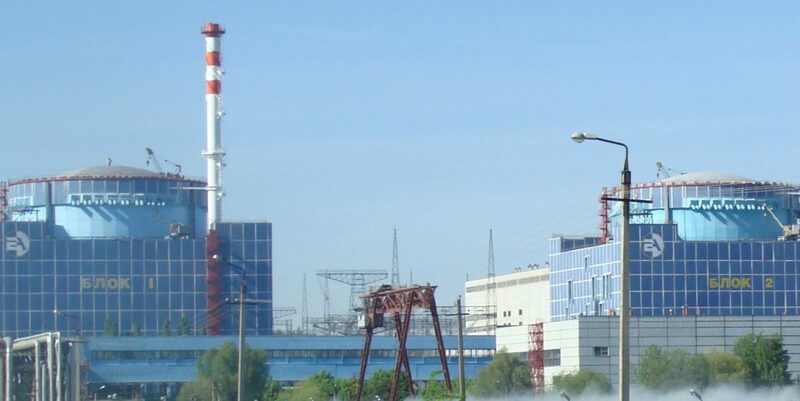 No ways have been set out to attract funding for the installation of pollution control equipment at those thermal power plants, which would continue to be operated after Ukraine’s energy system is synchronized with the pan-European network of ENTSO-E. It should be noted that, along with commitments to deliver energy reforms under the EU-Ukraine Association Agreement, Ukraine’s participation in the Energy Community, despite significant delays and obstacles, remains a major driving force for the implementation of a consistent energy policy aimed at sustainable development. The implementation of the National Emission Reduction Plan (NERP) of major pollutants from large thermal combustion plants, which is one of the key commitments under the Energy Community Treaty, would allow a reduction of toxic air pollution in Ukraine in the medium term and would provide a long-term vision for the phase-out of coal-fired power generation in Ukraine. This year, a Climate Action Group has been established within the Energy Community as a political platform for harmonization of climate and energy policy both within the governments of the participating countries and between the contracting parties. Former EU Commissioner for Climate Action Connie Hedegaard and minister Ostap Semerak were appointed as co-Chairs of this agency of the Energy Community, which puts Ukraine in a responsible position. Climate and energy policy requires clear and ambitious mid-term and long-term targets set by the government, increased cooperation between ministries, harmonization of different strategies, sectoral plans, programmes and respective roadmaps for their implementation. Each sectoral document should include measures to improve energy efficiency and provide energy saving, as their implementation can give a quick and significant economic effect, while reducing greenhouse gas emissions. Decentralization and localization of energy production should be supported to allow for a socially just and inclusive transition. Ultimately the decisive factor for success is the political will to modernize the state, improve the welfare of the population, and create new highly skilled jobs. The transformation of the global economy, which has already begun in response to the need to counteract and adapt to climate change, presents major opportunities for Ukraine. Oleg Savitsky is an independent expert on climate and energy policy. Oksana Aliieva is coordinator of the programme Climate change and Energy Policy by Heinrich Böll Foundation in Ukraine. This article is based on a more extended article published by the Heinrich Böll Stiftung in Kiev: Energy transition is the biggest challenge for Ukraine.